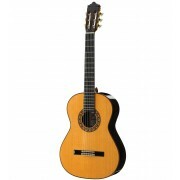 The guitar Camps M2000 is a professional classical guitar with cutaway body for the demanding performers that wants the comfort and flexibility of a cutaway body guitar without compromising the quality and the sound. Elegant concert guitar from Camps guitars made from 1st pick of the 1st class soundboards, back and sides. The tone is steady and clear in every register and perfectly balanced, with great attack.